ALTON, VA (Aug. 26, 2016) – American paralyzed BMW driver Michael Johnson is coming into the homestretch of the 2016 Continental Tire SportsCar Challenge season and things are beginning to fall into a consistent rhythm for the Michigan native. His first of the final three races of the season will be contested this weekend at Virginia International Raceway in the Continental 150. "I'm super excited to be back racing at Virginia International raceway,” said Johnson. “It has been a few years since I've ran here but I'm ready to tackle the circuit! After the last race at Road America, we repaired all the damage on our BMW 228i M Sport and it's ready to go! I can't thank the entire JDC-Miller MotorSports crew for all their hard work! We will be ready to battle on Saturday!" 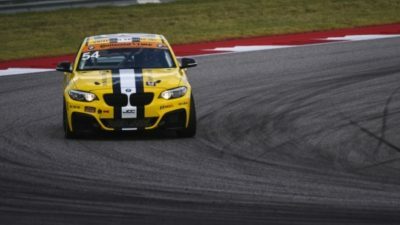 The eighth round of the 2016 Continental Tire SportsCar Challenge season will see Johnson and his co-driver, Cape Town South Africa’s Stephen Simpson, take to the 3.27-mile, 17-turn road course when VIR opens for practice this week in advance of the two hour, 30 minute race contested on Saturday. Qualifications will take place on Fri., Aug 26 beginning at 6:35 p.m. (ET), followed by the race on Sat., Aug. 27 at 1:55 p.m. (ET).